Behind the Ear Hearing Aids (BTE) are used more than any other type of hearing aid; they are held behind the ear with a tube that fits into a personalised ear mould. 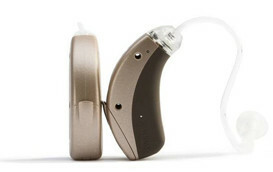 Sometimes they contain a wire to carry the sound, but more typically it is sent down the same tube that connects to the hearing aid. 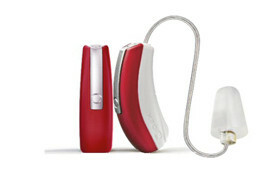 The advantages of BTE hearing Aids are that they minimize feedback, which means they are less likely to whistle. They are the only type available free in the UK from the National Health Service. A disadvantage of BTE is that if you are a sporty individual they may not be the most secure, and if you wear spectacles they tend to conflict with the arm of your glasses for a space behind your ear. Although they are large and noticeable, their very size gives them an advantage – they have the space for many options and a complex circuitry system. Also normal hair growth can conceal them, especially for women. They also tend to be used for small children because as their ear changes they need a new mould, unlike an in the ear hearing aid as these would require a whole new unit. The design has conferred advantages and disadvantages; because the microphone is outside the ear the patient loses what would be a natural resonance of the ear, but on the plus side the frequency response of the amplification system can more or less cancel that fact out. Another factor of the microphone being external is that it does tend to pick up wind noise. It can also be distracting as hats tend to knock them out of position and coat collars are apt to rub on them, however these are minor and most patients say they learn to live with these factors. They are also more at risk of water damage from rain than the in the ear hearing aids. If you are interested in trying a Behind the Ear Hearing Aid, why not use our ‘Try before you buy’ service, which means you can make sure you are entirely happy with your Hearing Aid before you spend any money! 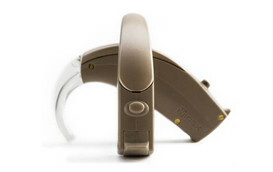 This type of hearing aid offers a clear sound and comfortable fit, with the receiver so close to the ear drum nothing is lost in transmission, making it a very efficient hearing aid. Cros hearing aids are for those who have lost hearing in one of their ears and BiCros are for those who have lost hearing in one ear and need amplification in the other ear.